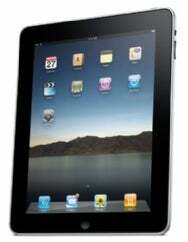 Before diving into the details of the iPad, it’s worth recapping some of the details of the product. There are currently three versions available, all identical save for the amount of onboard storage: a $499 16GB model, $599 32GB model, and $699 64GB model. Three other models with built-in 3G networking in addition to Wi-Fi will be available later in April, at the same storage sizes: 16GB for $629, 32GB for $729, and 64GB for $829. Before you buy a Wi-Fi-only model, it’s worth considering how you might use the 3G models. With the iPhone and iPod touch, Apple has been reluctant to talk about processors and speeds, preferring to treat those products as magical black boxes. But we must forgive Apple for crowing a little bit about the processor that powers the iPad, because it was custom-designed by Apple itself. The new A4 processor, running at 1GHz, is a “system on a chip”—in other words, it was built to run the iPad, not chosen from a parts list and adapted to work for the iPad. We’ll have more extensive speed and battery testing in the next few days at Macworld.com, but the short version is this: it’s fast and the battery lasts. 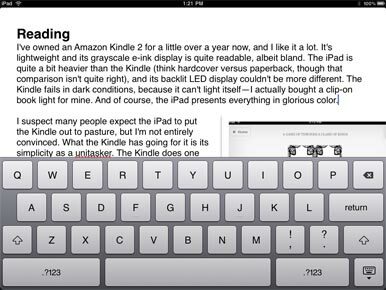 Typing in a Pages document in landscape mode. The iPad’s software keyboard is more typeable than I would have ever thought possible. This is not to say that it’s a suitable equivalent for a hardware keyboard—it’s not, and Apple has as much as admitted it by offering a Keyboard Dock as an optional accessory. But with some focus and a little practice, I was able to type with both hands at a decent enough pace. The keyboard in landscape mode isn’t quite the size of a real keyboard, but it’s close, and once you’ve got both hands on the keyboard you can really start picking up speed. The software keyboard makes good use of the shift keys, giving you quick access to two extra punctuation symbols. Unfortunately, there isn’t enough room to include the apostrophe or quotation mark on the first level of the keyboard, and those symbols and the numbers were the speed bumps in my otherwise passable typing sessions. I don’t think I would ever choose to compose a long e-mail or write a lengthy document using the software keyboard, but it proved good enough for small bouts of typing. I tested both Apple’s Keyboard Dock and several Bluetooth keyboards with the iPad, and they all worked well. The iPad supports keyboard shortcuts, so anyone who has trained themselves to hold down shift to and press the arrow keys to select text, then press command-X to cut the text and command-V to paste it somewhere else, will discover that those keys perform those very same tasks on the iPad. And the iPad is plenty responsive, even to a fast typist like myself—I never noticed it dropping any characters. I’ve owned an Amazon Kindle 2 for a little over a year now, and I like it a lot. It’s lightweight and its grayscale e-ink display is quite readable, albeit bland. The iPad is quite a bit heavier than the Kindle (think hardcover versus paperback, though that comparison isn’t quite right), and its backlit LED display couldn’t be more different. The Kindle fails in dark conditions, because it can’t light itself—I actually bought a clip-on book light for mine. And of course, the iPad presents everything in glorious color. What the iPad offers is, quite simply, more. It’s not a unitasker. It reads books, but it also surfs the Web. (The Kindle has a Web browser, but it’s terrible.) It runs apps. Competing merely as an e-book reader, it’s a tight race, but the iPad’s boundaries go far past where the Kindle was ever intended to go. Speaking of apps, one of the iPad’s strengths is that it can display e-books from more than one source. Apple’s iBooks app is front and center, of course, and it’s attractive and functional, though hardly the best iPhone OS book-reading app I’ve ever seen. (My vote there goes to Eucalyptus.) iBooks will even display DRM-free Epub files you can make yourself or download from the Internet. But Kindle for iPad is here too, giving iPad users access to Amazon’s entire e-book library (and allowing them to sync those books between the iPad and other devices, including Kindles and iPhones). Other readers will undoubtedly follow. That adds even more to the iPad’s flexibility. 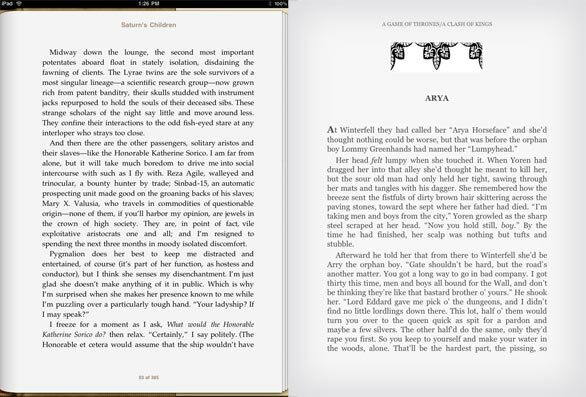 Reading a book in iBooks (left) and Kindle for iPad (right). A year ago, when I bought my Kindle 2, I cancelled my print subscription to the San Francisco Chronicle and replaced it with a Kindle subscription to that newspaper. If I decided to stop using my Kindle tomorrow in favor of the iPad, though, I would actually be taking a major step backward when it comes to reading that particular paper. That’s because every morning there’s a new copy of the Chronicle on my Kindle, pushed automatically over the network. Meanwhile, Apple hasn’t provided newspaper and magazine publishers with any standardized method to sell their products, other than the obvious one: the iPhone/iPad app-development kit.